Sometimes, in the context of their ongoing dispossession of the Palestinian people, the State of Israel–despite itself–actually manages to do something good. All too often, it simply means not doing something bad that they were planning to do. And, when they do happen to follow a path of decency and common sense, it is often because the government has been forced into doing the right thing by the nation’s High Court of Justice. Cremisan school and agricultural terraces, looking east. In the distance Road 60 crosses the valley atop a tall viaduct, linking Jerusalem with illegal Israeli settlements in the West Bank. That is the case here, which in any event gives cause for celebration: The beautiful Cremisan valley lying to the west of Bethlehem and its neighboring municipality of Beit Jala–after years of legal challenges, along with pressure and support from many quarters, including the Vatican–has apparently been spared the ugliness and profound disruption of Israel’s Separation Barrier. 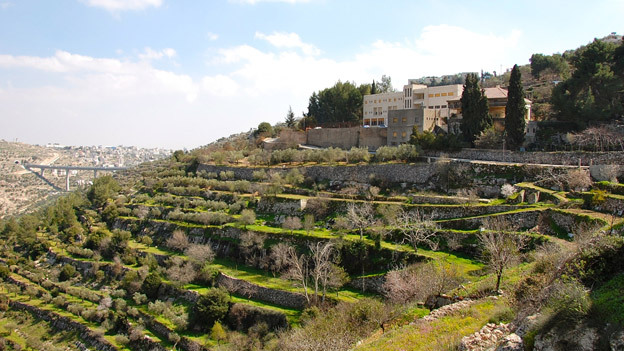 The slopes of Cremisan include a large tract owned by the Salesian order of the Roman Catholic Church, plus land belonging to about 50 Palestinian families. On separate compounds a few hundred yards apart, the Salesian sisters operate a school educating some 400 local Palestinian girls, while the brothers produce excellent wine and olive oil (once popular among Israeli Jews who, before the Second Intifada, used to come here regularly). The terrain is lush with traditional terraced agriculture. 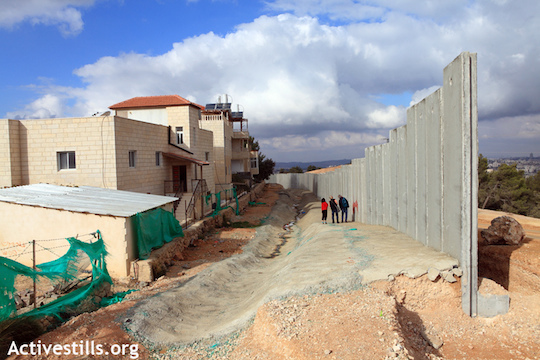 All this was threatened by the insistence of Israeli military authorities that the demands of “security”–the southern outskirts of Jerusalem lie across the valley–required scarring these slopes with the 30-foot-high concrete wall. In the process, it would have meant cutting the two religious houses off from each other, separating the local farmers from their fields, and of course expropriating large swathes of land. 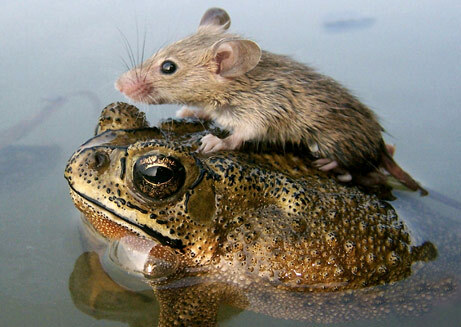 It is this plan that, at long last, has been set aside. When I lived in nearby Bethlehem in 2013, the fate of the Cremisan area was very much a live issue. Already local Christians, joined by international supporters, were holding a weekly outdoor mass and vigil on the church property, as they continued to do until the matter was resolved. Now, with a measure of justice–which means just leaving the place alone!–it has been. The Franciscans have published a video report (3 min.) on the Court’s decision. Here is the print story from their online magazine. Here is the story as reported by Haaretz on 02 APR 2015. Meanwhile, the Occupation juggernaut continues to tighten its stranglehold on the neighboring village of Walajeh, which lies on lands adjacent to Cremisan. If the Israelis have their way, the 2,000 besieged souls of Walajeh will soon become prisoners in their own village, literally encircled by the Separation Barrier while much of their lands are grabbed for illegal settlement, or confiscated and locked up as yet more Israeli-designated “national park” land. Knowing that the original village of Walajeh, which lay a few kilometers to the west, was destroyed by Zionist forces in 1948, just adds to the stunning perversity of it all. For an UPDATE on the situation in Walajeh (April 2016), see HERE. This entry was posted in Bethlehem area, Separation Barrier, The Occupation and tagged Cremisan, High Court of Justice, Palestine & Palestinians, Rephaim Valley National PArk, Separation Barrier, The Occupation, Walajeh, West Bank. Bookmark the permalink.